Bedtime Stories stars Adam Sandler as Hotel handyman Skeeter Bronson who was once promised the Hotel of his father by the man who bought him out. We are first introduced to Skeeter as a young boy, with his father nurturing his wonderful imagination. Unfortunately as he grew up, he soon realised that happy endings don’t happen in the real world and when his father’s successor fails to choose him as a manager for his new Hotel, this brings another crushing blow for Skeeter until his sister Wendy (Courtney Cox) asks him to watch her children. Unfortunately Skeeter has not seen his niece Bobbi (Laura Ann Kesling) and nephew Patrick (Jonathan Morgan Heit) for four years, after knocking out their father, however thankfully his sister is now divorced. To his amazement, he discovers that his niece and nephew have lived a strict life of healthy eating and study. Unable to entertain them, he comes up with the "novel" idea of devising interesting bedtime stories at night and whether by chance or by magic, certain elements of these stories come real. When Patrick says in the story that it will rain gumballs, the next day it does. When Bobbie says that he will become the new manager of the Hotel when telling the story, it does happen. Skeeter than comes up with the idea to manipulate the story events, however things don’t always go as planned in this entertaining comedy that will keep children of ALL ages entertained. The love interest in the movie is played by Kerri Russell who plays Jill, the best friend of Wendy, Skeeter's sister. Apart from Sandler who is the star of the movie, it also stars some wonderful performances by Australia’s Teresa Palmer as a Paris Hilton clone Violet Nottingham, Russell Brand as Skeeter’s best friend Mickey (very funny) and Guy Pearce and Lucy Lawless as the movies evil doer’s. Of course, the two kids also lend themselves well to this movie as does the Hamster with the huge eyes. It’s definitely Disney at its best. The Blu-ray version also contains both the Blu-ray and DVD version with a plethora of extras that include outtakes and other behind the scenes featurettes. 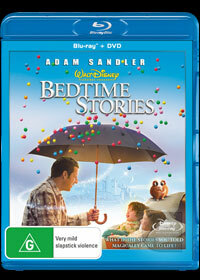 On Blu-ray, the video quality is outstanding with vibrant colours, sharp images and an impressive surround sound track. If you're after a great family movie than Bedtime Stories is the one that carefully uses special effects and sets to recreate the wondrous stories of Skeeter, Bobbie and Patrick.